When I was a young boy my father came to my brother, sister and I and said, “If one of you will come to town with me I promise you won’t regret it.” I had been to town before so I said no. My brother mumbled something about being bored sitting in the car while Dad was at some church meeting. But my little blond-haired, snaggled-tooth sister beamed and said she would go. My Dad and sister loaded up in the car and drove the three miles to town while my brother and I went back to playing. We played for about an hour when we looked up the long dirt driveway from the main road that led to our house and saw that sister of ours riding a bike down the road. She had a grin so big that you could count the bugs on her snaggled-teeth. Hey where did you get that bike we asked? “Someone gave it to our family,” she said. Dad, who had been following her in the car, pulled up and had a smile on his face. We looked at him like he had pulled a fast one on us. We were a poor family, so for us to be given a used bike was a big deal. And to be the first to ride it was a bigger deal. And to get to ride it all the way home from town—that was a privilege that my sister would gloat about to her older brothers for a long time. Our problem was that we didn’t know a good opportunity when it was offered. She trusted her father and reaped the benefits. Our God is the God of the open door. When people trust God and walk through open doors, the power of God is set in motion and things beyond our ability start to happen. The custom in those days was for a parent to arrange the marriage for their children. Parenthetically, putting a hand under the thigh was another ancient custom. It was a way to seal a deal in those days. Nowadays we just sign a contract or shake hands. Call me squeamish—but I like our way better. So, Abraham commissions his servant, and Eliezer assembles a caravan of ten camels with gifts, we’re told. He goes to the city of Nahor. He kneels down by a well and he prays and waits, and soon a young woman named Rebekah approaches. Rebekah had no idea what was going to happen. She just walked through that door in trust. What if she hadn’t walked through? What if she got to the door and then stopped? One thing for certain, you would not know her name or her story. There is no tragedy like the tragedy of an abandoned open door. What is the door of opportunity God is opening up for you right now? 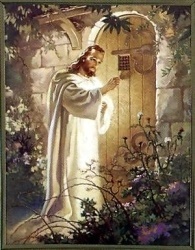 At the end of the ancient book that we love Jesus speaks of another door. This is not a door of opportunity. It is a door to the heart, but it is closed. This is one of the most tender images in the Bible. One time when our twin granddaughters were about four years old they were spending the weekend with us and I walked down the hallway towards my room and could hear them playing house in their room at our house. Little red-headed girl chatter about tea, flowers, and cake. I went in an enjoyed a wonderful pretend meal. When you love somebody, you wonder; will the door always be open? Will I always be welcome in that heart? What will I do if one day I knock and they don’t answer? God has designed you with this door to your heart that can only be opened from the inside. No one can force you to love them. No One. Not even God. Only you can open the door of your heart. God Himself will not violate that door. But He won’t go away either! Because He loves His children too much. If you will open the door of your heart, he will come in and you will share the most tender and rich intimacy you could ever imagine. Doors of opportunity and intimacy are waiting for you. Open the door. I promise you won’t regret it. Thank you for these wonderful words Joe. I’m passing it on, hoping others find encouragement through this as well. Our twenty year old daughter “closed her door” to us this week. My heart is broken. It was no surprise. We saw her headed down this road of bitterness. I can only imagine how God has felt when I’ve not answered His knock. Please pray that our daughter opens her door to us and Christ before she heads down a painful path.